When my three sisters and I were little, mom and dad would pile us in the VW bus (the original minivan) with packages of homemade treats my mom had whipped up. The day after Christmas, we would visit all my mom’s aunts and uncles to deliver the goods and a little Christmas cheer to her elderly aunts and uncles – she had 6 aunts and uncles on her mom’s side alone! We would end the visits by stopping by two family friends’ homes, who had children our age we could play with. It was our reward for being well-behaved at the homes of the family elders. My husband and I live about 2.5 hours away from my parents. While some of my husband’s immediate family (two uncles) are close by, the closest family member to me is my uncle who is just over an hour away. A few years ago, I decided to start my own Christmas tradition of making homemade goodie deliveries to family. In my case, the “family” is the group of people we spend the majority of our spring and summer with at baseball fields — some of them we see on the football field and basketball court as well. 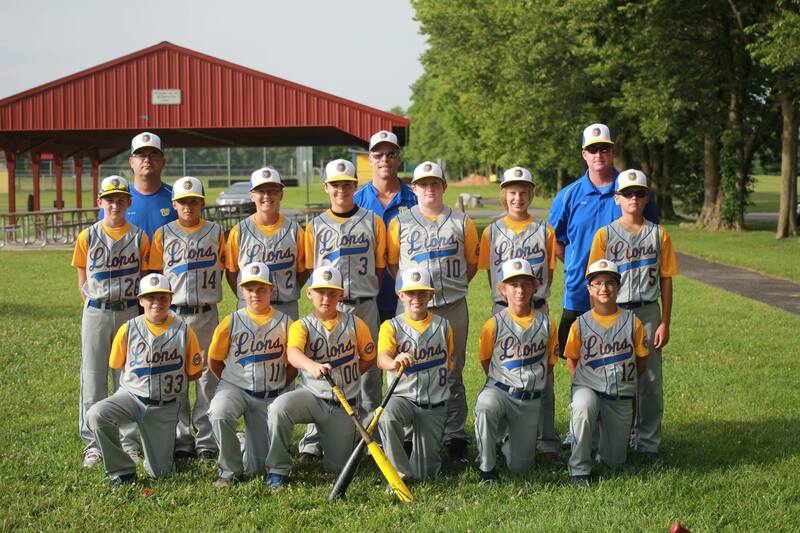 While not all the families still are part of the baseball team my son Alex plays on, I consider them family. I bake lots of cookies to decorate and I make mini-breads. I stuff enough into each container for the family members, as well as chocolates (holiday themed stuff like Snickers, Kisses, KitKats, etc.). This year’s cookies included sugar cookies with decorations baked in, and gingerbread cut out candy canes and stars decorated with royal frosting. Some stars were had yellow tinted royal frosting with gold sugar pearls and gold sugar sprinkles. The other stars had white royal frosting and a variety of Christmas-themed sprinkles on top. The candy canes were all outlined and had white stripes. Every other stripe was flooded with the white royal icing. Sprinkles in red, green, gold, or silver were then added on the icing and the excess was shaken off. The mini-breads were Snickerdoodle, pumpkin with chocolate chips on top, and banana. No matter how you celebrate the holidays, it’s always important to include your family members. Even those that don’t share your DNA. Each year, my organization does a mailing to about 2,400 individuals. The mailing is comprised of multiple pieces of various sizes and weights. In order to put the package together, we ask staff from a number of departments to help with the assembly line of collating the materials, stuffing them in padded envelopes, and labeling them in preparation for mailing. This takes two full days. The reward for those that help is a pizza lunch each day, time away from your desk, and a chance to chat with colleagues you might not otherwise have the time to catch up with. 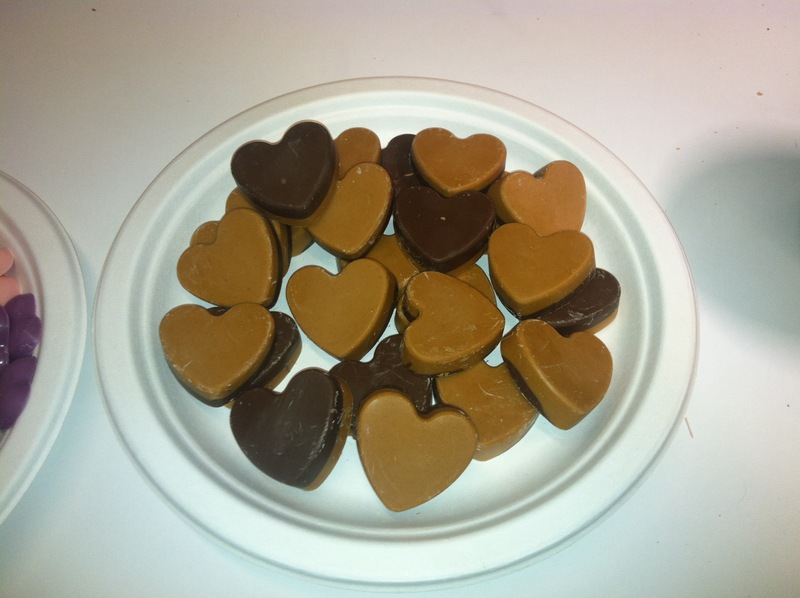 And this year since the project moved to my group, I decided to add sweets to the mix. 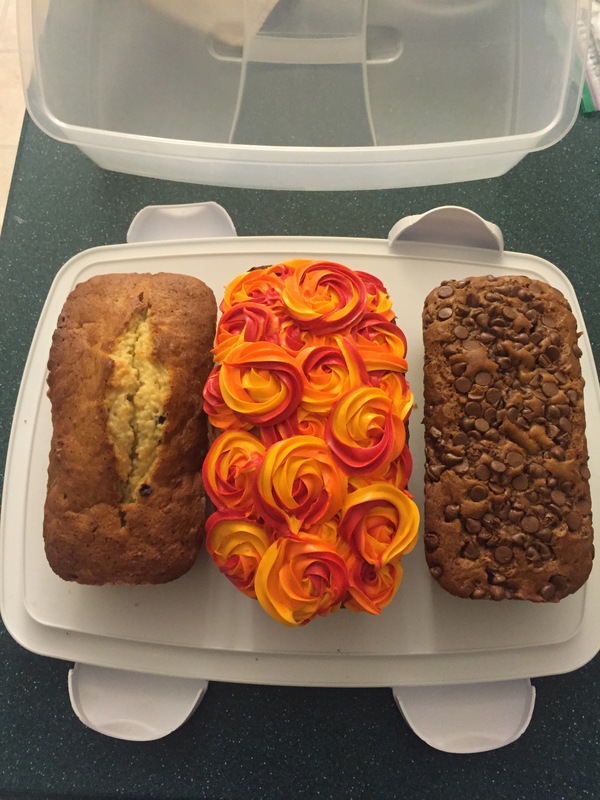 For the first day, I made two pound cakes (box mix), cinnamon coffee cake (box mix), and banana bread. 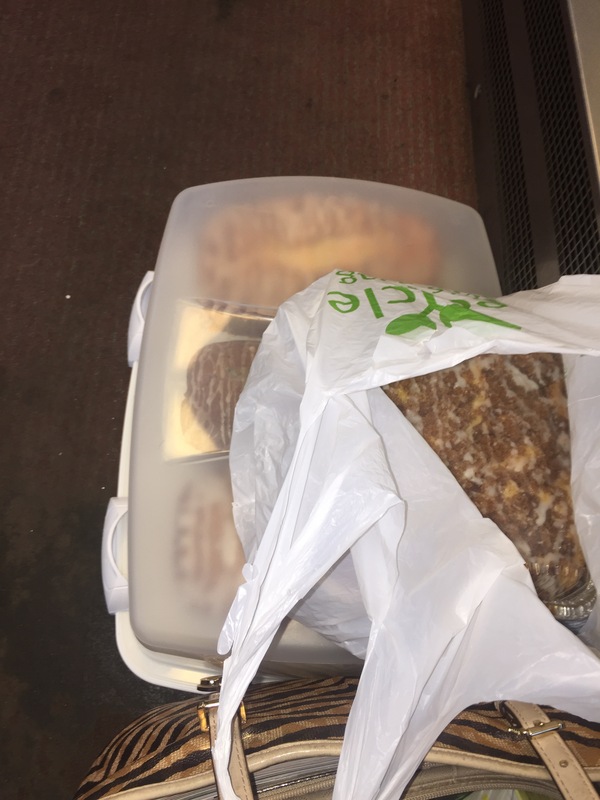 The one pound cake had a powdered sugar/milk glaze that was infused with orange extract, and another had a glaze infused with raspberry extract. The banana bread recipe is one I’ve used before. I would link to the brand I used for the pound cake mix (Betty Crocker), but the link on their page for the pound cake mix goes to a box mix for pineapple upside down cake instead. 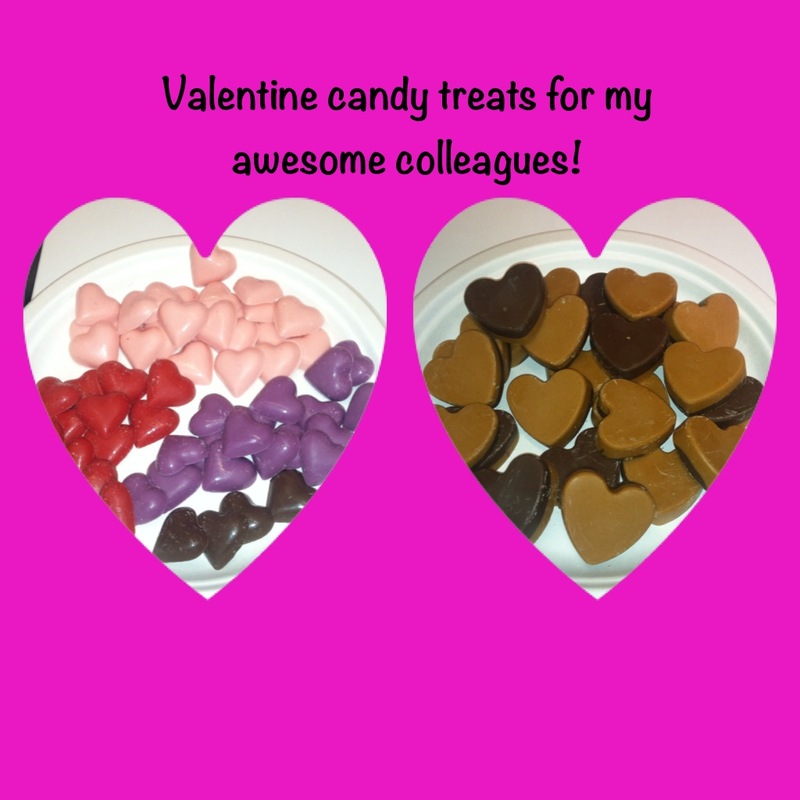 This was an easy way for me to add a bit of sweetness to a tedious task. Monday: On Sunday evening, I baked Rolo-stuffed snickerdoodle cookies. I was mailing them to a friend’s daughter who had just moved to the University of Maryland to continue her undergraduate education. 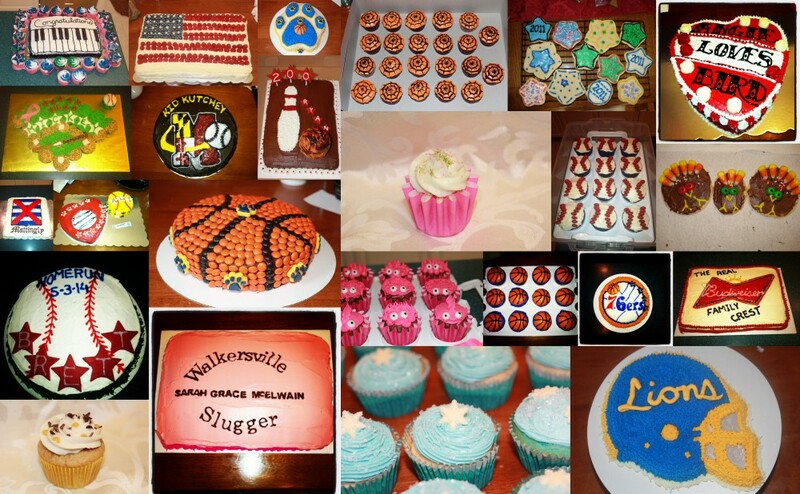 For two years, I’ve been baking goodies for friends’ kids when they move to college for the first semester. On Monday, I shipped them out via priority mail. First random act of kindness done! 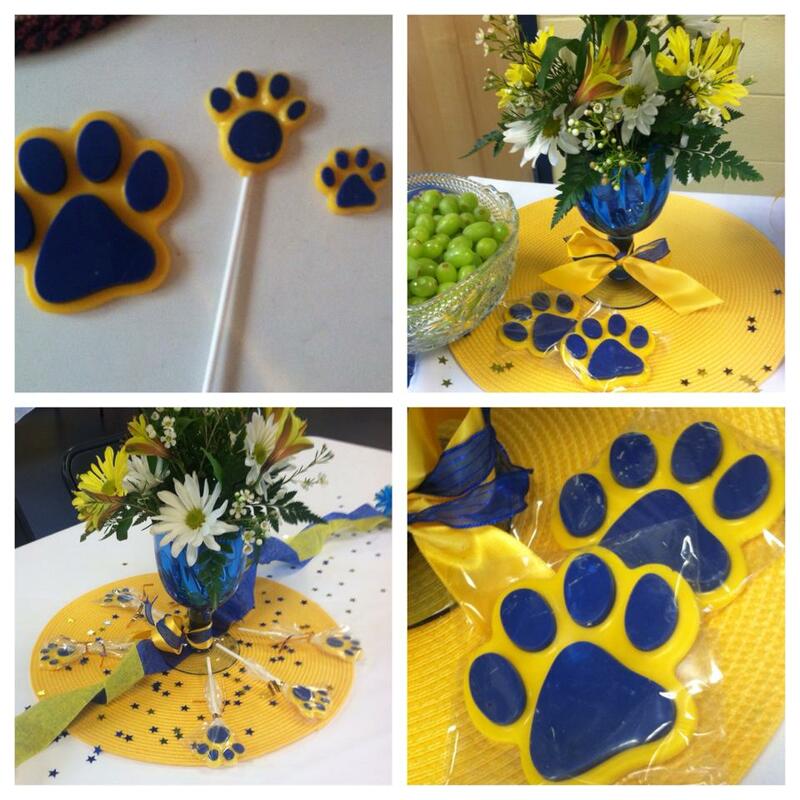 Tuesday: Over the weekend prior to Random Acts of Kindness Week, one of the local moms had asked if I could make lion paw cookies for an event at the high school. I was on business travel and wouldn’t have time to bake and decorate cookies by Tuesday — let alone find a lion paw cookie cutter! 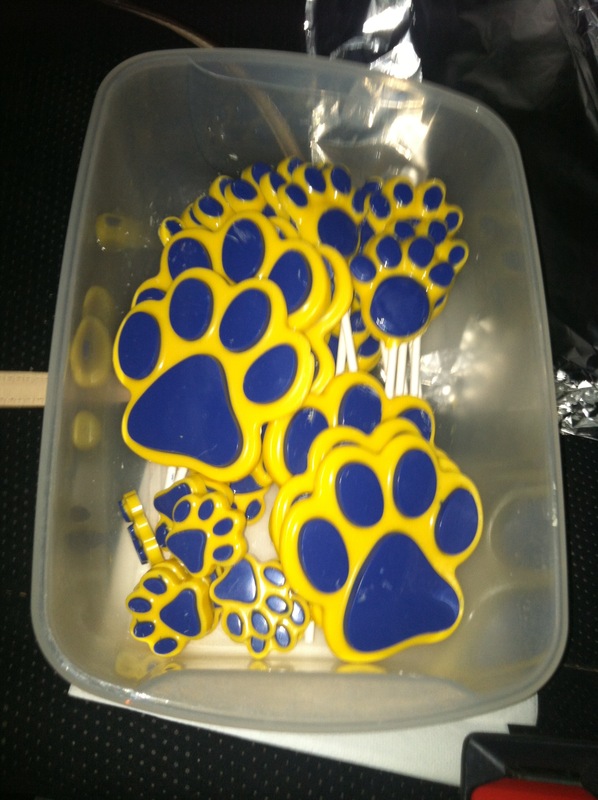 However, I do have lion paw candy molds (in small, pops, and large size) because our local grade, middle, high school, and recreation league sports are all blue and gold Lions. She posted this collage of pictures to Facebook with a thank you to me. 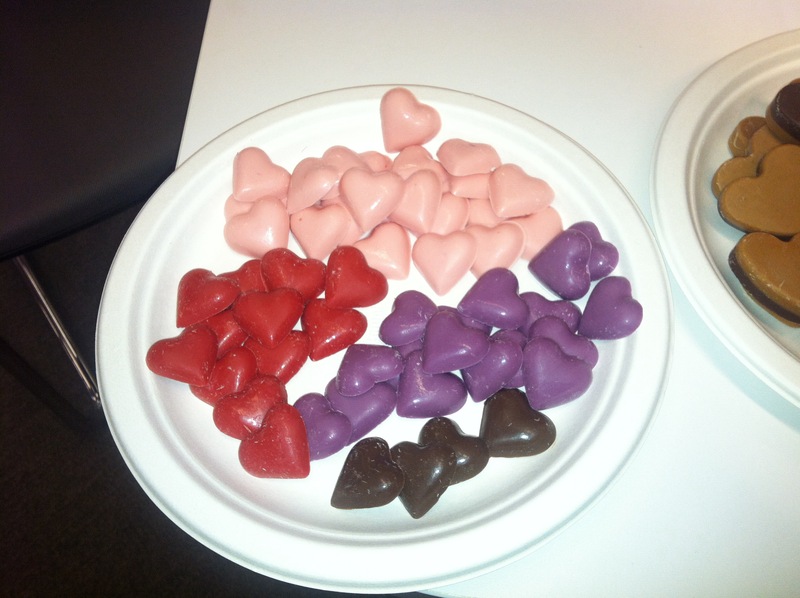 The candies ended up looking great with her other decorations. Wednesday: On Wednesday, my colleagues and I had an all-day event taking place. It was a big event, bringing together teams from our department, as well as IT, communications, and an outside vendor. Since it was an all day event, I made gingerbread and pumpkin mini-breads for our “war room” so people had goodies to munch on. I topped them with Sugar in the Raw before baking, to give them a sweet crunch on top. Because I had made the breads on a week night, I used box mixes. On weekends, I’ll make breads from scratch, but during the week with limited time, I use box mixes. The breads were gone by lunch. 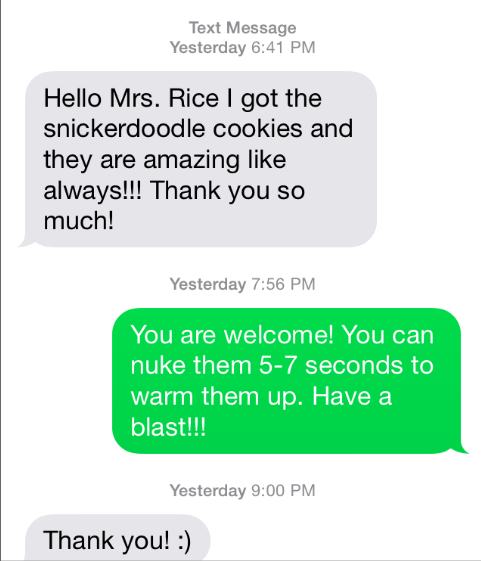 Friday: On Friday, I received this text from my friend’s daughter. Unfortunately, the mailroom hadn’t delivered her packages until Friday, even though they arrived on Tuesday. It was a nice way to end a week of Random Acts of Kindness through baking. We attended a New Year’s gathering at my friend Rebecca’s house. It was a small party, so I only made three desserts. For the kids, I made Rolo-stuffed snickerdoodles. I’ve made this recipe so many times and it is a fan favorite with the kids. I use mini-Rolos; regular size Rolos produce a HUGE cookie. I have found that both times I made this recipe, I have more than enough of the cream cheese filling and don’t end up using it all. The filling can be swirled around, but the batter is not very thick, so it tends to mix itself if you pour it around the pan instead of in just one spot. The chocolate chips in the batter may give the false impression of the cake not being done if you use a cake tester. Be sure it’s cake batter and not a melted chocolate chip on the tester. When I pulled this out of the oven, the cake really condensed once it began to cool. Don’t freak if it starts to lose some height. I used Pam baking spray with flour, and the cake slipped out of the pan very easily. When I pulled the cake out of the oven, I brushed Kahlua on the base of the cake so it would soak into the warm cake. 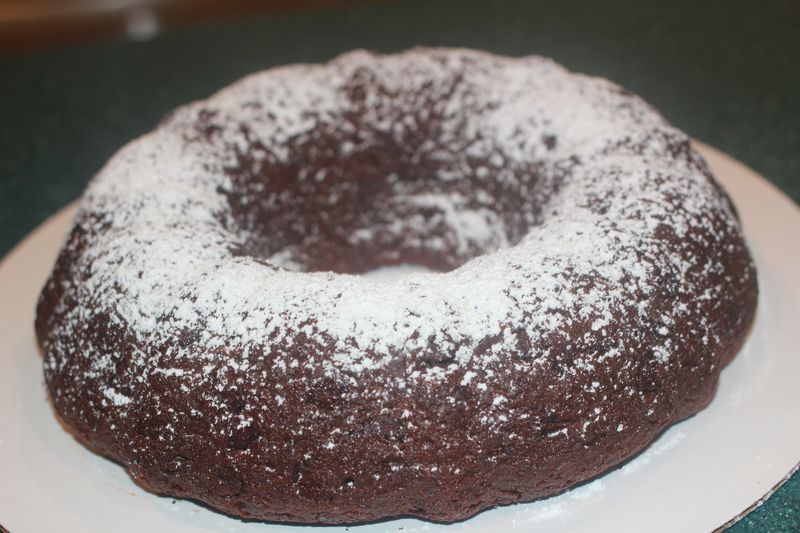 When I took it out of the pan and before I dusted it with powdered sugar, I brushed Kahlua on the top. Again, this was to get it to soak into the cake while it was still a bit warm and in case any of the Kahlua in the batter had baked off during the cooking phase. The cake is rich and dense, and it was another winner! Hope your New Year was spent enjoying time with family and/or good friends, as well as good eats! My Christmas tradition each year is to bake goodies for the players/families of my son Alex’s Travel and All Star baseball team. This year, I made a multitude of mini-breads and sugar cookies. 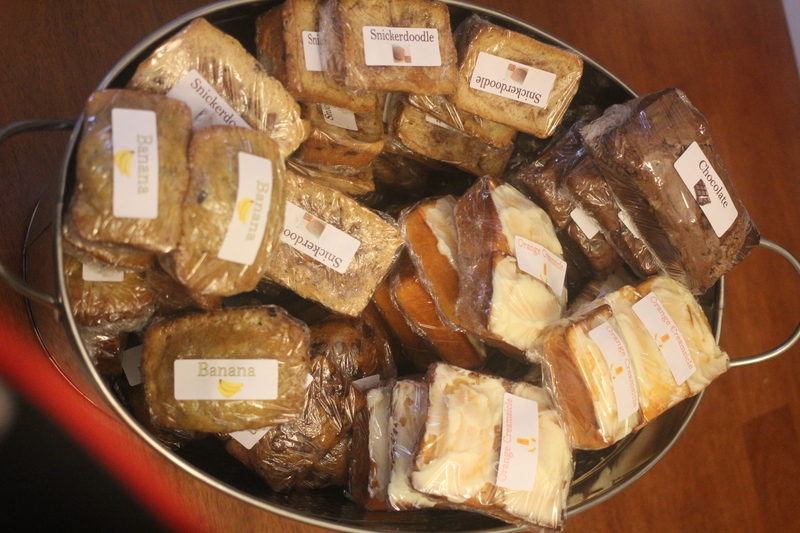 The breads included banana, snickerdoodle, pumpkin, sour cream chocolate, and orange creamsicle. The pumpkin bread is a box mix with milk chocolate chips sprinkled on top before baking. I label the breads so people know what they are getting. Here’s the big bucket of mini-breads after I had baked 90+ of them! For the sugar cookies, I had seen a recipe for sugar cookies and royal icing in Food Network magazine, so I decided to give it a try. I made cut out stockings and piped on the names with green frosting left over from the Christmas Tree Cake I made. 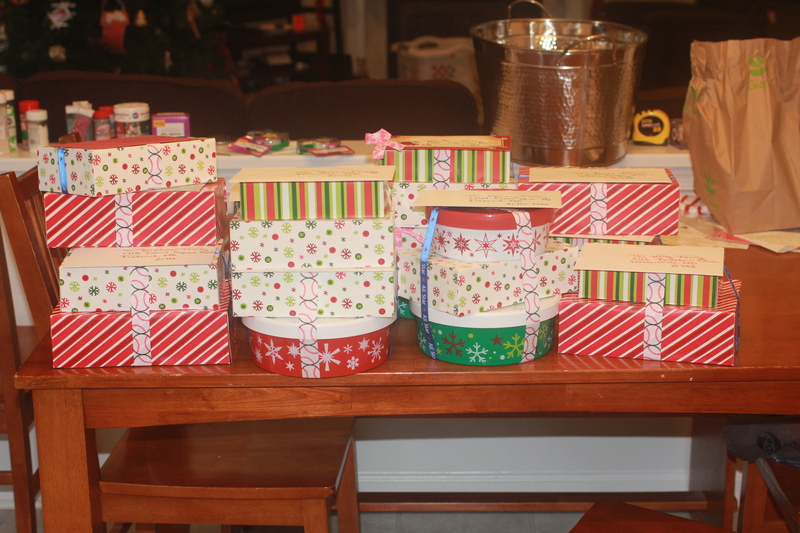 I then personalized the goodies with the names of all members of each family. I piped on the outline of the top of the stocking in white royal icing and then outlined the bottom of the stocking that I had dyed red (took a vial and a half of red to get this color!). 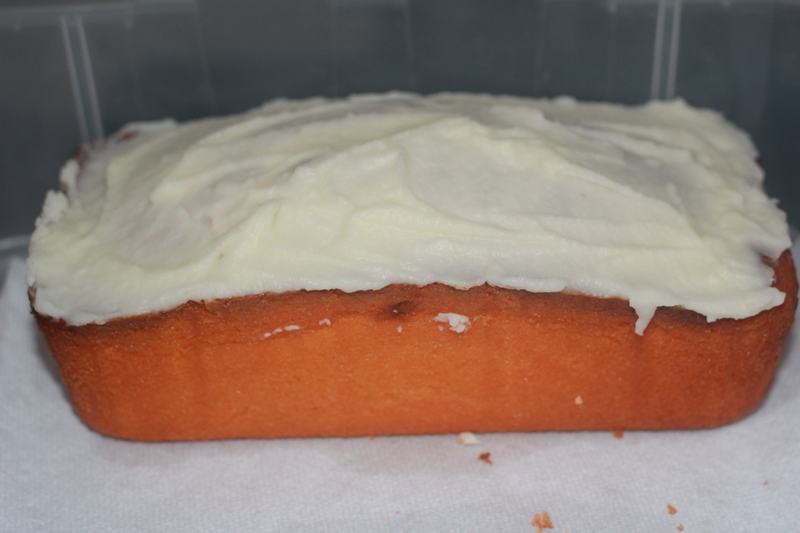 I then thinned the remaining icing and filled in the piping. Finally, I decorated the stockings using a variety of Christmas sprinkle decorations. My friend Rebecca, her boyfriend, and her kids. She’s just a really good friend, who charted a new course in her life this year. So thanks to the families and to the players. It was another amazing year on the field – from the state semi-final game to the weeklong tournament at the Ripken Experience in Myrtle Beach. Thanks to my baseball family for being my “other family”. Happy Holidays, everyone!